In the beginning, there was mere survival. 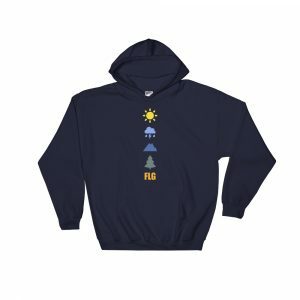 To the early residents of Flagstaff, the winter and its commonly heavy snow storms were a thing to be endured until the return of spring and a slightly easier way of life. Things like hiking, hunting, horseback riding, sledding, and snowshoeing were mere tools for hauling goods, gathering water, wrangling sheep and cattle, or for transportation. Strictly utilitarian. Of course, as we know, life cannot remain all work and over time and with more comfort and security play became inevitable. This story is told over and over in the history of human nature. Fishing is developed as a tool to feed a coastal community, and turns into a leisurely pastime for children and adults. Hiking to and below the rim of the Grand Canyon from Flagstaff during the colder months begins as a way for ranchers to feed and winter their herd, but then hiking and exploring the canyon become a recreational sport. And the story is the same for the introduction of snow sports in Flagstaff. Right around the time that two Norwegian brothers, Ole and Pete Solberg, moved to Flagstaff, AZ to work for the lumber industry, Flagstaff was changing from a frontier town of all work and no play to one of prosperity and more free time for residents. 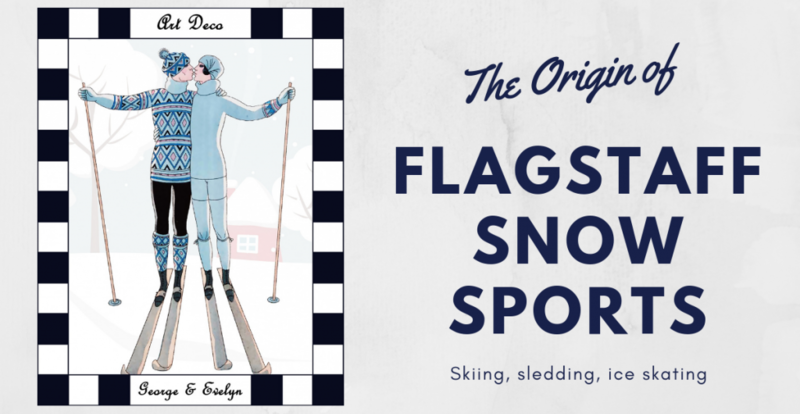 So, when Ole and Pete introduced skiing to town of Flagstaff it quickly took root and from about 1915 to 1933 snow sports became all the rage. And not just skiing. In 1933, the Arizona State Teachers College (now NAU) yearbook called Flagstaff the “Lake Placid of the West”. Let’s discover how this happened. 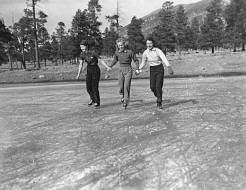 One of the first forms of snow sport that became popular in Flagstaff was ice skating. Many of the first residents in the area were ranchers and so stock tanks and cattle ponds were a common site. In the winter, when the water would freeze over, residents would strap blades onto the bottom of their shoes and glide along the glassy surface. The popularity of ice skating increased even more with the damming of the Rio de Flag drainage in Clark Valley to create lower Lake Mary in 1904. The large, broad surface became an ideal location for winter play by Flagstaff residents. The next step in Flagstaff’s winter sports journey comes to us in the form of sleds, or really anything resembling a sled that can be sat on and ridden down a slope. In the very early days, 1883 and beyond, the heart of Flagstaff was located where downtown is today and the road we now know as Leroux Avenue was called Gold Avenue. The southern portion of Gold Avenue was the business district, but to the north, up the hill, many more affluent residents built their homes. This sloped neighborhood became known as nob hill, and the inner town location of snow play. During big snowstorms, the residents would close down Leroux/Gold Ave. and kids and adults would fly down the slopes of the hill. 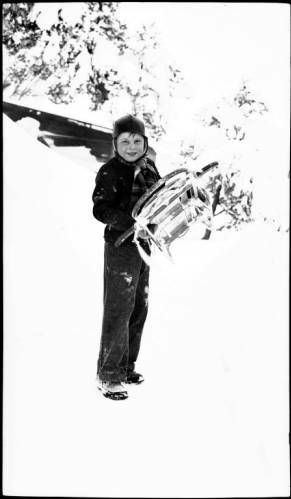 Another popular area for sledding for early Flagstaff residents, albeit the more adventurous, were the slopes of Mars Hill and Observatory Mesa. Which is an area that was also used by Flagstaff’s first skiers for their daily fix of recreations. 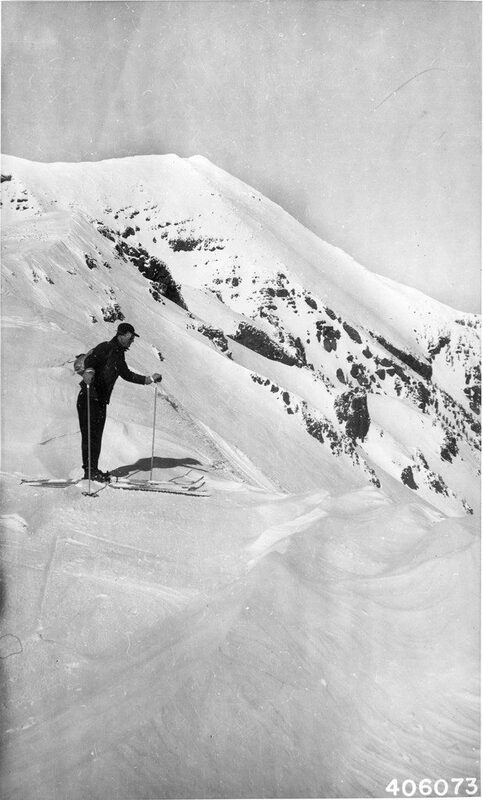 As we mentioned previously, skiing was first introduced in Flagstaff during the winter of 1914/15 by the brothers Ole and Pete Solberg and the sport quickly gained in popularity. According to historical accounts, the brothers particularly enjoy skiing down the slopes of Observatory Mesa down into town. It is even said that they built a ski jump on the hill and held recreational exhibitions for the town. The use of Mars Hill and Observatory Mesa for skiing, is also mirrored by that of Sheep Hill. You know Sheep Hill? The big cinder cone on the east side of town with its western flank torn away for mining. That one! According to early skiers in Flagstaff, at one point there was a 10-ft jump build on the side of the volcanic cone as well as a three-sided structure that protected skiers from the elements. They would hike to the shelter, where a fire would burn, warm up and then ski down, back and forth they would go. Of course, the most famous and longest lasting result of the introduction of skiing and snow sports to Flagstaff is the Arizona Snowbowl. In the early and mid-1930’s residents skied the slopes of Hart Prairie, but the first official ski run on the San Francisco Peaks themselves was built in 1938. This is when the U.S. Forest Service approved the construction of a road and a building towards the base of Hart Prairie, making the operation official. As with Sheep Hill, they had a small ski area and a shelter and it remained at this location until the structure burned down. When the residents sought to rebuilt after the fire, the main ski area was moved about a mile and a half further up the mountain to its current location. 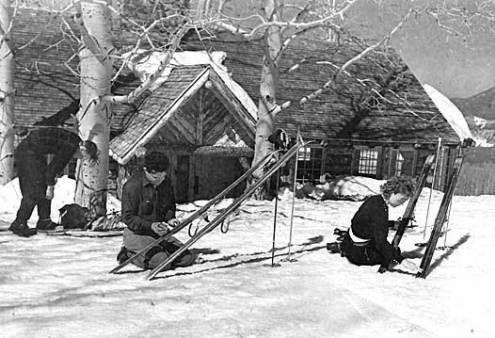 Flagstaff High School developed its first ski team in 1940 and they practiced on the San Francisco Peaks. After World War II, the operation was purchased by a man named Al Grasmoen and he officially turned it from a simply sport destination for locals to an official ski area. He installed the first couple rope tows and began offering things like equipment rentals, instruction, and running competitions. From here, the Snowbowl would continue to develop over the years (although to a much lesser degree than many other ski areas across the country), but this is a story for another time. Winter recreation today, would barely be recognizable by these early adopters. Our gear is now so incredibly advanced, the sports we partake in are numerous and widespread, and except in very special scenarios it is exclusively used for play and not work. However, some of the elements are the same. We are still seeking to enjoy our surroundings and laugh with out neighbors, we still skate along icy surfaces holding hands with our loved ones, we still push the limits of our abilities through sport.